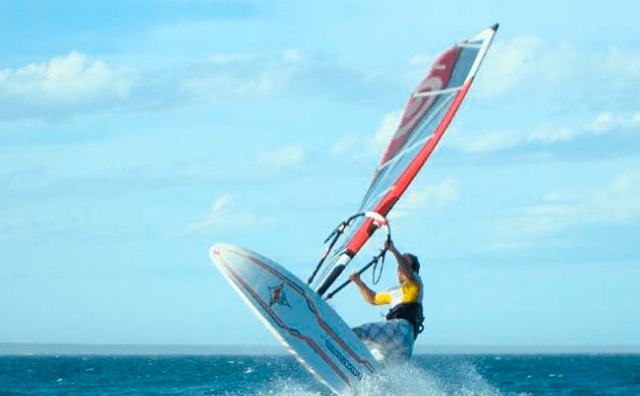 A quick and easy guide to getting started in the world of windsurfing, also called surf to sail or sailboard. Your equipment is divided into two parts: the table and the rig. The board is similar to a surfboard and is the part where you stand. It has one or more fin and daggerboard (in some models) under water. To lower it you have to pull the lever back (stern) and to raise it, when you have to pick it, make the opposite side (towards the bow). The rig consists of the sail, the mast and the boom. The boom is the part that you grab, although the mast can also be used as a support. There is also a rope from the boom to the mast, this is the halyard and is used to lift the sail. In addition, the boom often features a harness. Stay on your knees and grab a halyard cap, without lifting the sail yet. With an apprentice board you will have enough stability, swing back and forth with your feet to get it. Try to keep your back and body upright. If you notice your lower back hurting, it means you are flexing too much. This is known as “safety” or “control” position (you have total control with little effort). With the straight mast, tilt it to your left. Your body should transfer this imbalance (the center of the sail effort is not offset with the center of the lateral resistance of the board) to the board and cause it to move (or rotate) clockwise. Tilt the mast to the right and the board will move (or rotate) counterclockwise. The stronger the wind and the more you tilt the mast, the faster the table will move (or rotate). If there was a strong breeze you should carry out this point more slowly. Another possibility about steering is that when you tilt the mast to the stern, the bow will bow to the part from which the wind comes. This is also described in the next section of this guide. On the other hand, tilting the mast forward makes the board look for the direction of the wind. Look and check which side of the stern you are on and put a hand on the boom so the mast guides the sail in the direction of the bow (front). When you are ready, put your other hand on the boom as well. Do not let the sail pull you, the mast should be perpendicular to the board, so rest and keep your arms straight. This is known as the number 7 and tells you the position. Keep your feet behind the mast, with the front toes facing forward. Make sure it is in front of you, and keep in mind that you will get tired if you have to lift the candle many times. Now you can go sailing! This method also works by navigating: tilt the mast forward and back using the boom to determine the course. As you improve, change from time to time something (just one) like the table or the size of the candle. This way you will become an expert. Be aware that there are more people in the water. Motor boats should give way to sailors, also have preference boats of companies; Do not do anything stupid. In the port it has preferential starboard, that is to say, sailors with the right hand in the mast have preference. Shout “starboard” to remind those who arrive if you have the right to pass, but keep your course and speed so they can dodge you. Dodging a navigator at the port may seem convenient, but it is not if he is doing the same. It’s not a competition! If you sail in the port, go in the same direction as them. Try not to land with the board, could make a hole that would cost to repair. Classes are not very expensive and you learn best when you are only you and the teacher. The helmet and life jacket help you to have more confidence. In some places they are obligatory. If you play “follow the leader”, you will learn a lot about how to maintain posture and movements. Try to go with someone, the experience is always helpful (especially if they endure more time without falling into the water than you). It is always good to go with you in case you have problems. Dress well, the sea is cold. Experiment with balance, falling several times will make you realize the limits of the table. Be agile with your feet. Check out E-bay to buy equipment. If you catch the trick, you will change equipment right away and buying a new one would be very expensive. Ask windsurfers with experience about different brands and how to use them. Buy yourself an appropriate board according to the wind conditions. If you live in a windy area, it is convenient to use a wide board (for example Mistral Malibu) and add a larger, higher performance candle to your collection and try to learn how to use it. 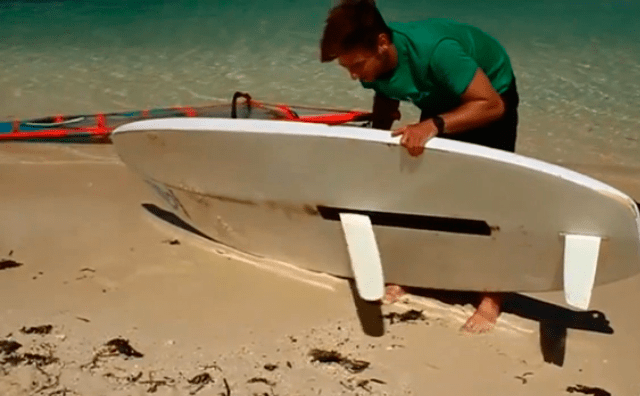 Over time you will also need a short board to use the 5-meter sail that possibly comes with the board. This sail MUST NOT easily propel the wide board into flat with normal wind conditions. If you navigate with softer winds a longboard (a longer board) is a good first choice and investment that will surely last while you are windsurfing. Avoid buying starter boards for more than 15 years (unless they are longboards) and less than 60 cm wide. A used and old table is not a good deal whatever the price, unless you live in an area with frequent gales. Although ferries are motor boats, let them pass (see above: boats of companies have preference). The same applies to cargo ships, etc. Never sail with a strong wind to keep you off the coast until you have more experience. Watch out for the local wildlife and the tide, including the rough waters. Make sure you are able to swim at least 50 meters.